One of the main reasons that champagne houses covet working with the leading airlines is they like the exposure for their brands. They want to be seen as the preferred pour in the first or business class cabin. Partly because this is an affluent audience that’s difficult to reach, they will even agree relatively unprofitable deals to get the listing, though of course they are at pains to deny this. But they know there is a large potential downside to this exposure. Will the cabin staff pour the champagne in front of the customer, thus showing them what the brand is and also what the reassuringly luxurious packaging looks like (this is a prestige cuvée market). And even if the staff are trained to do this, will the temptation be too strong to pour the glasses out of view, where any clumsy, unskilled pouring won’t be seen, bringing the champagne to the customer in a glass already filled? This shouldn’t of course happen on terra firma in a good quality restaurant. Champagne served by the glass should be opened (ideally) but certainly poured, at the table, in front of the customer. There are very good reasons for doing this, both from the restaurant’s and brand owner’s points of view. From the restaurant’s perspective, nothing is more likely to boost its sales of champagne that day than waiting staff opening a bottle of fizz and pouring it, in full view of other diners. It’s the best advertisement you can have for champagne by the glass. But customers paying a premium price for a glass of champagne, also deserve to see the bottle it comes from. The suspicion that any outlet might be serving something less prestigious than they are charging for, is not something a restaurant should arouse. From the brand owner’s perspective, they want the restaurant’s clientele to see what they are drinking, partly in the hope that such customers will want to buy the same wine again whether in another restaurant or at home and will in future know what the label looks like. When I met up for lunch last week with the team at Drinks International to celebrate publication of the fourth ‘Most Admired Champagne Brands’ supplements I have overseen and written, naturally we looked at the fizz list first. [You can read the magazine, our most successful and largest to date, via this link: https://goo.gl/U6jAnE .] 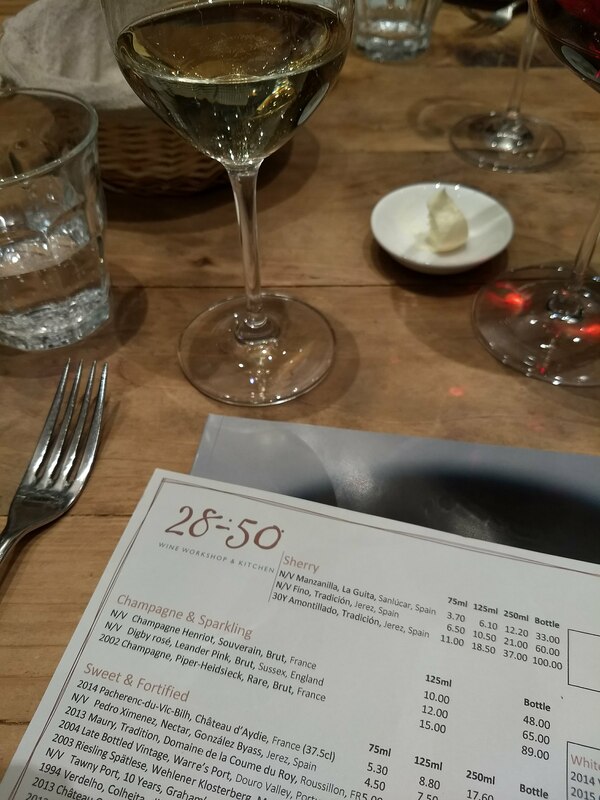 When we spotted Piper Heidsieck Rare 2002 selling for just £15 a glass (£89 a bottle) at 28-50 in Fetter Lane (it’s the same price in its two sister restaurants in Maddox Street and Marylebone Lane) it was an easy decision. This must be the bargain fizz deal in the on-trade currently. 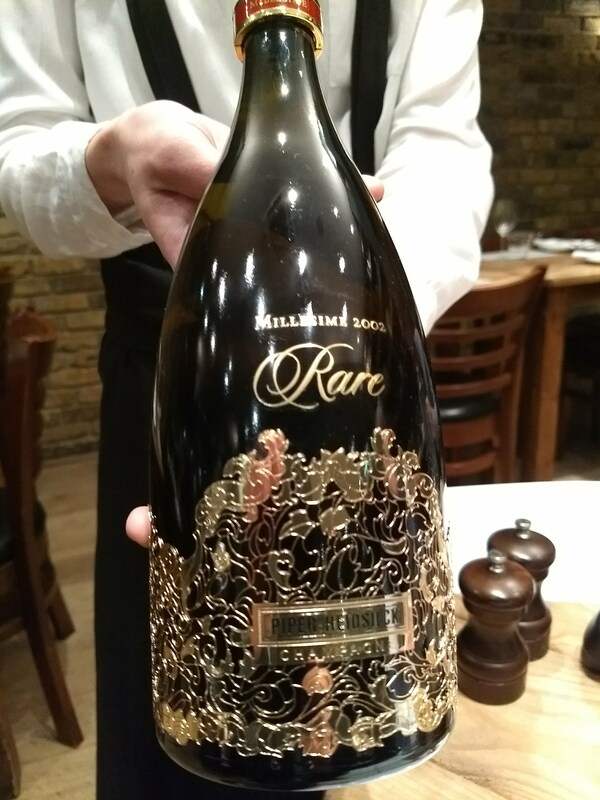 The wine came, not served in flutes, but in more generous, tulip shaped wine glasses — full marks to the restaurant here — but they were pre-poured away from the table and there was no sign of the elaborately decorated ‘Rare’ bottle (see photograph) that shouts ‘prestige cuvée’. A lost opportunity to impress us, or other diners, and possibly to make more sales. The other great, more venerable still, aged champagne bargain, that’s been around for several years now, is Charles Heidsieck 1995 Blancs des Millénaires. You can still find bottles of at one or two select retail outlets for around £150 (£149.95 The Finest Bubble). It won’t be there much longer because the next, 2004 vintage, has just been launched. We will be catching up on this and other new releases soon, plus some pink champagnes for Valentine’s Day.